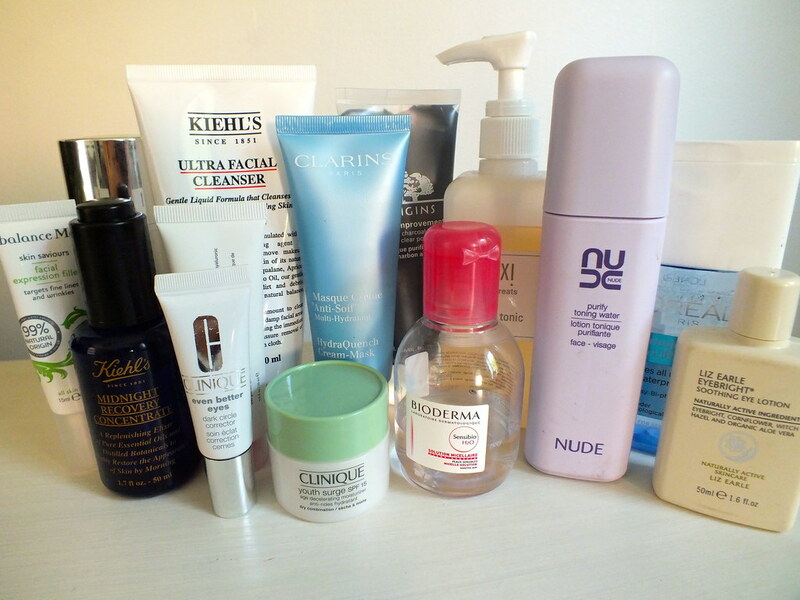 It's once again Empties time and I'm here with the last Empties post of 2013. These posts are one of my favourites as they give me an opportunity to see what I've used for the month and that I'm not mindlessly buying products and what I do and don't enjoy using. December's stash of empties only features a few items as I've been chopping and changing products a bit more than usual so let's get started. I've mentioned before that I'm a fan of L'Oreal Casting Creme Gloss as a way of changing up my hair colour and covering one or two pesky grey hairs and for the festive season I decided to go for Black Cherry. A month or two ago I went into the salon and had a colour done but didn't find any better result than from this at home remedy so I returned to my roots - sorry I couldn't resist! I try to time my at home colour prior to a night out as it's so quick and easy to use and leaves my hair looking super glossy it's better than any salon blow dry. I can't deny £13 is a ridiculous price for nail polish remover and was brought solely as a luxurious treat for myself for the decadent glass bottle and Chanel name but it is not a purchase I regret. Pretty and pink and strangely enough with a pleasant scent to it that works a treat to remove colour from your nails I would repurchase if I needed a pick me up or had a few Boots Advantage Card points to spare. 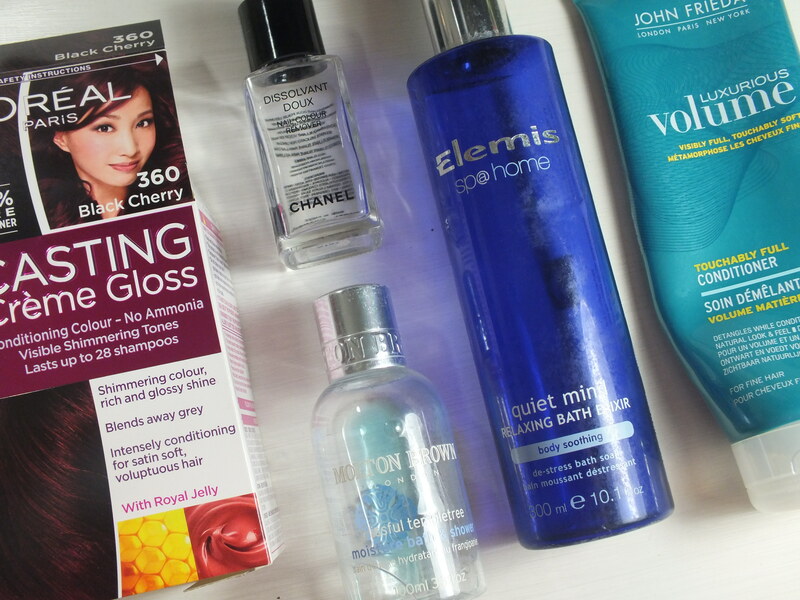 For now I'm planning to reuse the bottle and fill with the slightly less attractive blue remover I have in my stash. I've long been a fan of Molton Brown since it's appearance on QVC and when I first moved into my flat I had a whole box filled with their bath and shower gels. Since then I've favoured Jo Malone and other brands but was pleased to revisit an old favourite from the Selfridges Beauty Box in the Summer. Blissful Templetree, renamed Templetree used to be my favourite holiday scent and works best on skin that is feeling the effects of the harsh sunshine which of course we haven't been experiencing in the UK lately. Instead I've been using at home to remember holidays whilst I spend some quiet time in the tub. 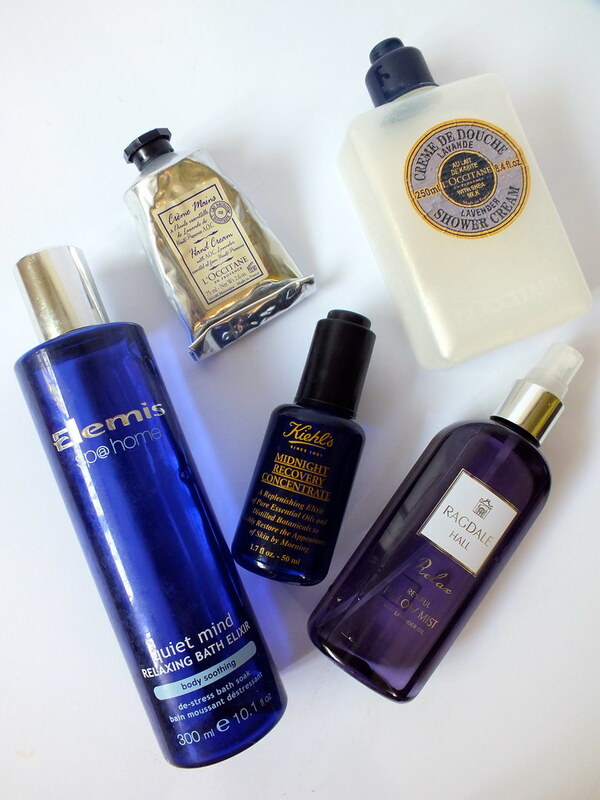 The bath elixir from Elemis had a mention in this post recently as a favourite for evenings when I need to relax and unwind. A great product for when I need to relax and unwind before bed. Firstly can someone tell me why despite using shampoo and conditioner, at the same time, the conditioner always outlasts the shampoo? I can't say this especially aids thickening and volumising of my hair in so much as it's all about the blow dry and products you use after the wash but this does offer a best foundation than other conditioners I've tried. Don't forget to link me up to your empties post for the month and let me know what you've been enjoying over the holidays. Well that's it, Christmas is over for another year and what a fabulous time I've had enjoying the break with friends and family. Lucky for me I'm still not back at work for another week so there's plenty more gorging on food and drink to be done for a few more days and then let the healthy resolutions begin. Christmas Eve was spent eating Chinese and drinking martini's with my friend and we woke by her son Christmas Day morning bright and early at 6am resulting in my turning up on my parents doorstep at 8am where dad made me a nice cuppa. The early start meant mum and I were able to get all the presents organised for my niece and nephew and I was even sitting there following a shower and full face of make up when they arrived - that's been unheard of the past couple of years. My niece and nephew frantically tore into their presents, as did I but sadly my SIL was missed as she was unwell all over Christmas. 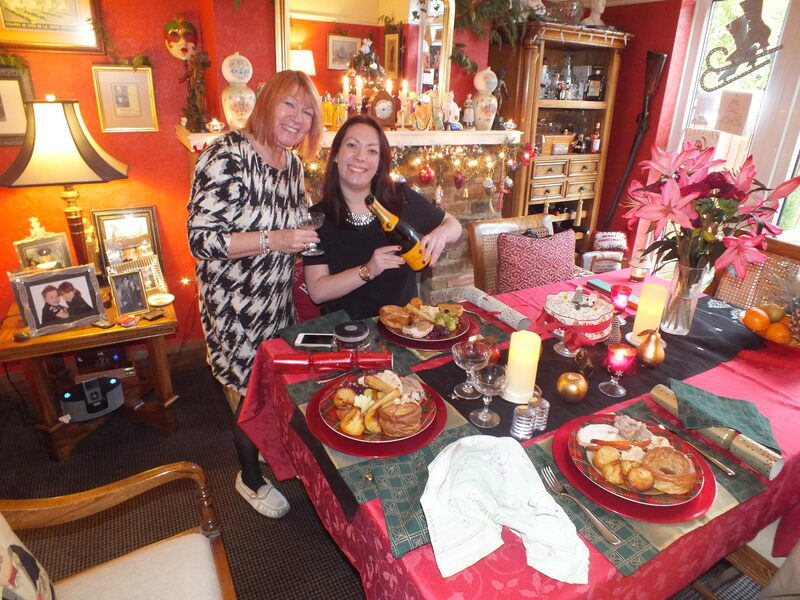 Once they had moved on to my brothers in-laws mum, dad and I moved on to my aunts house to visit family there and enjoy a few glasses of bubbly before returning home for a nice meal together. Armed with leftovers I returned home for a turkey and stuffing sandwich on the sofa whilst watching Downton Abbey, which I thought was really boring, anyone else think that? I was quite disappointed. Boxing Day was round 2 with the family at my presents and mum cooked the most delicious Gordon Ramsay Pulled Pork recipe whilst the children all danced around to One Direction - not me of course. The days since I've been pottering at home decluttering and organising cupboards as is my way after Christmas. I love finding new homes for my presents and throwing out the old and as you can see I did rather well and the obligatory 'what I got for Christmas post' will be up later in the week. Don't forget to tell me about your Christmas in your comments and what fun you've had. Time has somehow got away from me and as I type this there is still a bag to pack, a bath to be had and nails to paint. There were posts I would have liked to have got up before Christmas but now is not the time to worry about that and instead embrace the festivities and pour myself a glass of wine. As I mentioned in this post I will be at work Christmas Eve morning but as soon as the bell rings for lunch there will be a whirlwind of pubs to visit with family and friends to give holiday greetings too. So with that in mind for the next day or two I am signing off from Florence and Mary the blog but sure to be found Tweeting and providing the predictable photo of my Christmas Dinner on Instagram. Have a fabulous Christmas everyone and see you on the other side. When I first moved into my flat over 3 years ago there were many things I was looking forward to, inviting friends over and being able to sit on a sofa and watch TV rather than huddled in the bedroom, doing my own grocery shopping and having an excuse to buy a Dyson Vacuum Cleaner. 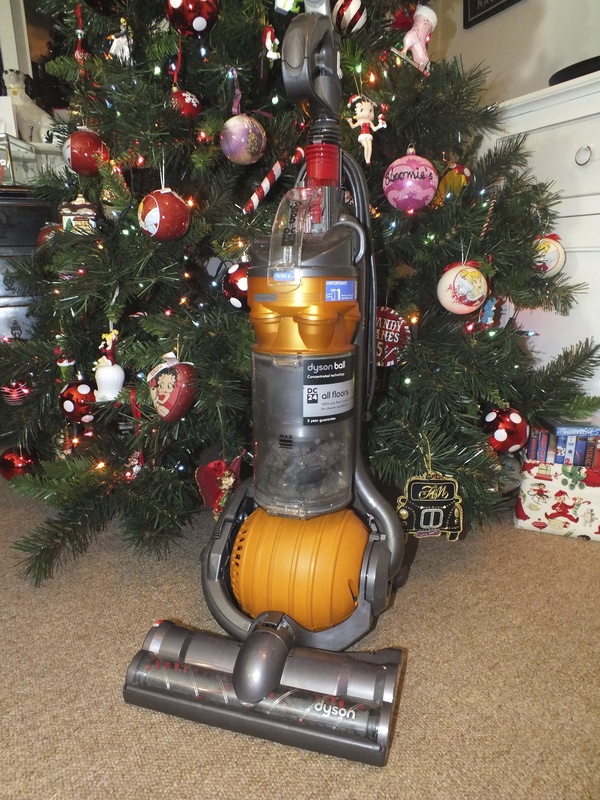 I don't know why Dyson cleaners were so on my radar but I was slightly obsessed and when the ball version came out I just loved how it twisted, turned and glided across all surfaces - oh yes I'd watched many demo's during my research. These days I employ the services of a cleaner as cleaning has become less of novelty these days but there are still times during their visits when I must reach for my trusty Dusty to help keep my home spick and span. Firstly when I brought an artificial Christmas Tree I was under the misconception they would not shed - this is not so. When I pull all the branches from their box and spread across the lounge floor and put together I'm left with all manner of green 'pines' everywhere and of course every time I burrow underneath the tree to switch on my fairy lights more of the pines drop to the floor - I'm a little concerned that in a few years I might see a bald Christmas tree. For this reason out comes the Dyson, usually in this case using the handy nossle which receives excessive use for this purpose and tackling all those cobwebs that seem to gather everywhere - and it's a given that as soon as my Dyson is put away in its special cupboard I'll find one I missed. Another side effect of Christmas is glitter, bits of paper, trims and all sorts. After I've finished a mammoth wrapping session like last night (whilst watching The Polar Express FYI) the floor is covered in debris that only the Dyson can tackle. I'm lucky in that my home doesn't see any Christmas entertaining as that is all hosted by my parents but I do love returning home Christmas evening to a sparkling flat so I can enjoy my turkey sandwiches in my festive home.. but come 27th December I want the festivities to disappear. This is the date my Christmas is officially over and I begin a post Christmas clean (even though there was already a pre-Christmas one). Anything that didn't bite the dust late November is thrown out to make way for my new presents. Cards are sent for recycling and my tree decorations are packed away for another year. It's back to that pesky tree which needs dismantling and packing away in the worlds most ridiculous box - does anyone else have the same problem that the tree seems to big to go back? Once again the Dyson is removed from the cupboard to help remove the last traces of glitter and Christmas tree and then I'll sit back and think doesn't it look bare in here and wish for my fairy lights back. Dyson are available here at Argos and they have all the details you need for picking out the perfect Dyson for you as well as some of those videos I mentioned watching earlier. 1. What are you usually up to on Christmas Eve? Christmas Eve is my favourite day of the Christmas season - even above Christmas Day itself. My plans vary year on year depending on friends and families plans. There was the year my friend and I booked tickets to see the Nutcracker but didn't get past the restaurant we started drinking cocktails in before. There was another drinking Winter Pimms in jugs with friends that resulted in a very late night and a very hungover Christmas Day when I was barely able to open presents and last year the one drink after work which lead to 5 bottles of wine to the less boozy ones spent at our local Carols on the Green and the children's Christmas service in church. This year I will be at work in the morning followed by some lunchtime drinks. Then it's hot footing to meet my friend and her family for drinks and then a meal with my brother our parents etc. 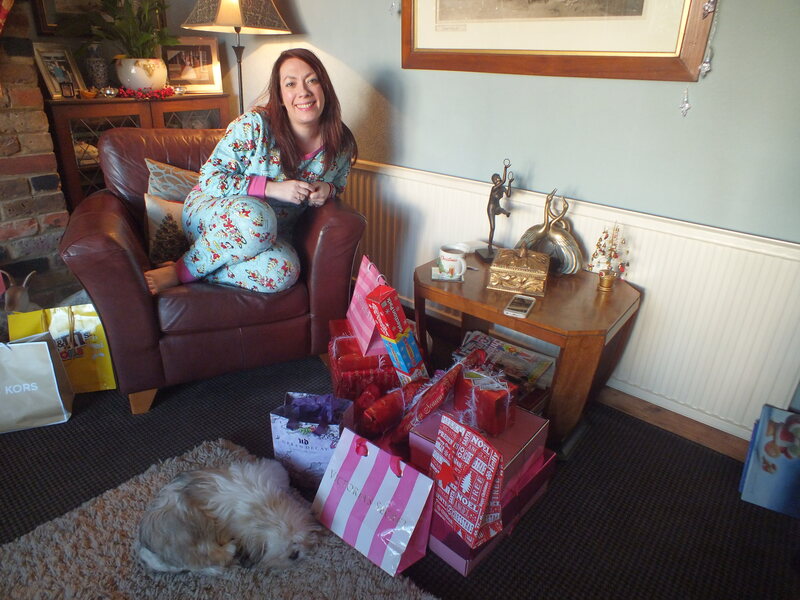 Slightly different this year will be spending the night with my friend and waking up with her and the cutie that is Charlie (who you saw in this post) Christmas Day morning. 2. Who do you spend your Christmas Day with? My parents. My brother will visit with his family in the morning to open presents and then mum, dad and I will crack open the champagne and enjoy a 'civilised' Christmas lunch together before the madness that is Boxing Day when all our family descend for what I see as a the proper Christmas celebration. 3. Do you enjoy giving or receiving gifts? I would be a liar if I said I didn't enjoy receiving gifts but you can't beat the look of pleasure on someones face when they open something you've brought for them, especially the children. I can remember one year buying my friends daughter a pair of Timberlands. I suspected that they would be opened and discarded quickly as children can find clothing boring but she immediately put them on and called them her jumping boots and proceeded to spend the rest of the evening jumping about in them - priceless. 4. What does your outfit consist of on Christmas Day? I tend to go for something nice but casual saving the dressier options for Boxing Day. This year it will likely be jeans and a jumper with a statement necklace as I won't really see people other than parents etc on the day. 5. Do you enjoy shopping for your loved ones gifts? This all depends on what's been requested. Previous years have been spent shopping in New York which was great fun finding items that couldn't be purchased in the UK. Once I put together an American food hamper for my brother and his wife filled with all sorts of treats which was great fun and I can't deny I love a trip to Toys R Us for the kids on my list. This year I was very sensible and stuck to a budget and did a lot of the shopping online or went for one specific main gift. Mum and I are especially bad at buying lot's of random gifts for one another but this year we said keep it specific. Likewise with the children, my niece and nephew are lucky enough to get treats throughout the year, my nephew has just had his birthday and my nieces is 2 weeks after Christmas and they can get so overwhelmed that they have two gifts to open from me on the day rather than lot's off odds and ends that they'll forget about in the long term. 6. Have you ever received a gift you disliked and pretended you liked it? I'm sure everyone has been in this position but generally I'm very lucky as my family divert to mum who has the list I've issued and she just purchases and/or divides the gifts out to those who want to give me something. One amusing year was spent with an old boyfriend. I had heard how bad his family were at presents and once we returned from the family gathering his dad walked in with a large bin bag and everyone literally opened and the dropped the random selection of gifts into it. I actually lucked out as a new entry to the family and mostly received chocolate which made everyone rather jealous! 7. What would your ideal Christmas be? I'm quite happy with how my Christmases are spent. Being single and with parents that are easy going about the day itself I can do as I please and so year on year plans can vary but ultimately I enjoy seeing my niece and nephew opening their presents, the quiet time alone with my parents and the noise of Boxing Day. I wouldn't say it's my 'ideal' Christmas but I would love to host a Christmas myself for friends, like you see on Friends for something different but naturally everyone is separated by their family commitments. 8. What is your least favourite thing about Christmas? It's a toss up between wrapping Christmas presents and writing Christmas cards. I take wrapping presents so seriously and want them to be wrapped so perfectly and no one cares like I do so it's almost a wasted effort but it's one I do every year. 9. What is the best gift you've ever received? One year I opened a surprise gift from my parents which was a framed Betty Boop drawing. They had seen it on an antiques jaunt and admired it and thought of me but as an original drawing it was slightly more than they wanted to spend for a random gift. On arriving home my dad kept thinking about it and ended up jumping back on a train into London to buy it for me. That picture still hangs in my flat today. Bradley Cooper? George Clooney? Do they count?! Jokes aside as I've mentioned I manage to spend a lot of the Christmas period with a complete mix of friends and family and I guess I kind of answered the question earlier in that a friends Christmas Day would be fun but this year I'm waking up with one BFF Christmas Day morning and the other will be joining my family on Boxing Day so I think I'm doing ok. Need a last minute Christmas gift for the man in your life who is a dab hand in the kitchen? 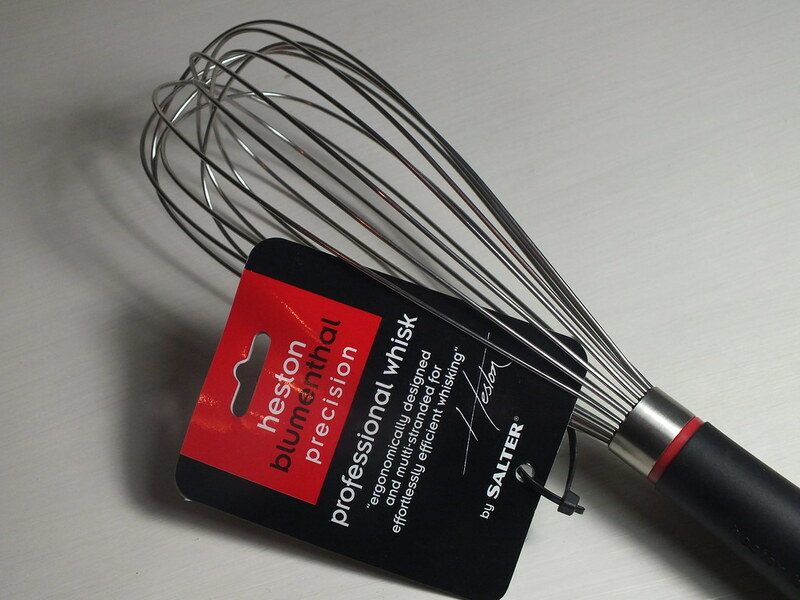 Or maybe you're looking to serve a decadent breakfast of scrambled eggs and smoked salmon Christmas Day morning then how about picking up the Heston Blumenthal Precision Professional Whisk*? I've had this whisk created by Salter with Heston's input in my possession for sometime and it has by far surpassed the cheaper ones I was previously using. 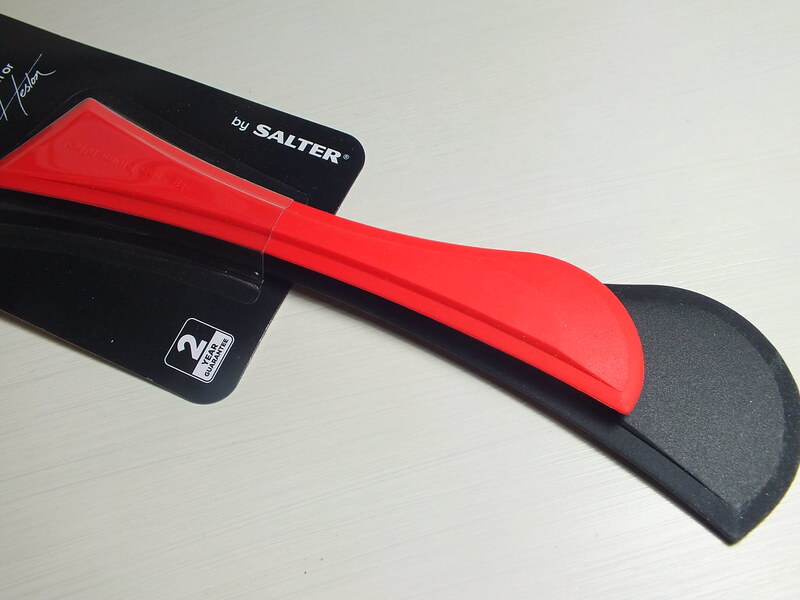 The strong, sturdy and non slip handle make the job of whisking by hand a less arduous task. There has been many a Christmas when I've received kitchenware as gifts (last year it was roasting tin and meat forks!) and it never disappoints as unless it's something quirky like a yoghurt or popcorn maker - although for the right person this would make good gifts too. 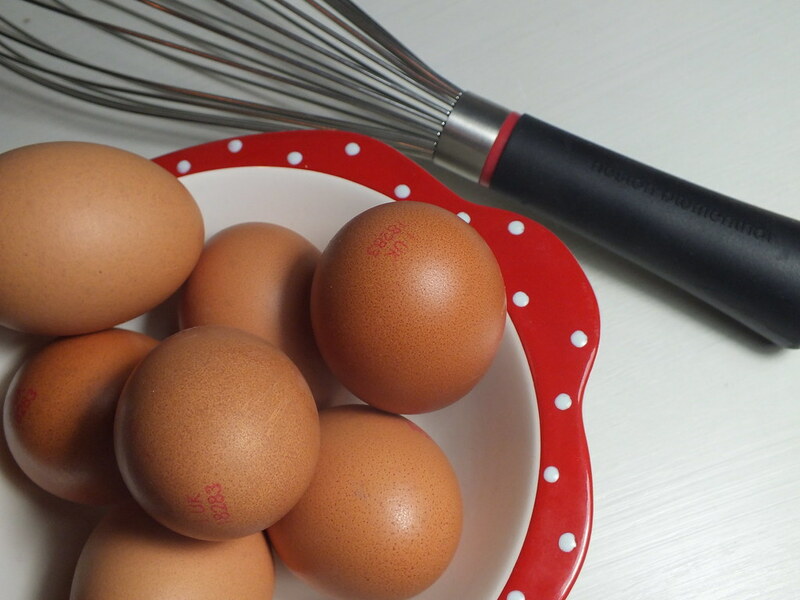 If you have a family member of friend who loves to bake you could create a small basket of goodies with a whisk, cupcake cases and sprinkles or if staying with friends why not arrive with the smoked salmon and eggs I mentioned earlier? Heston Blumenthal and Salter have created a number of items which you can find in local homeware stores, Argos and the like so do take a look. I also have the Adjustable Measuring Spoons* and Dual Ended Spatulas* which have proved so handy to use with my grilling machine rather than risking electricution with metal equivalents. You can find a list of Salter stockings here. 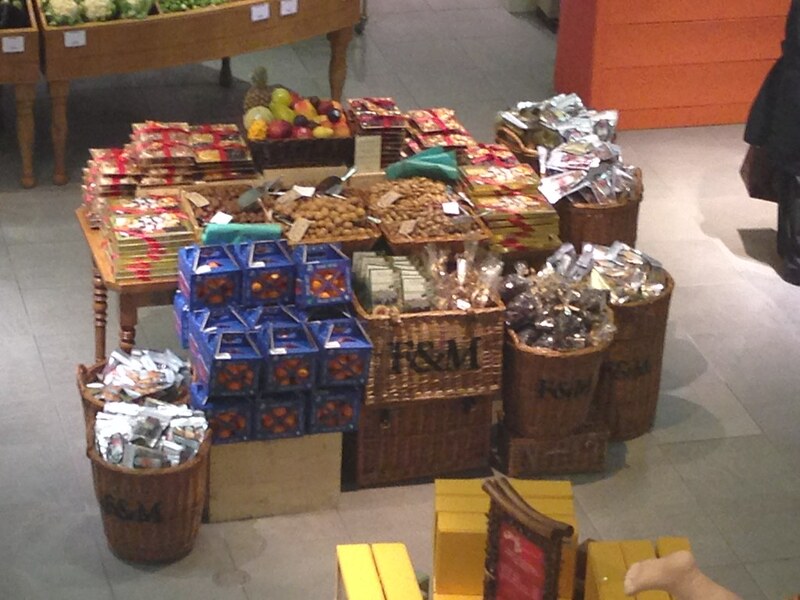 So hands up, are you doing any last minute shopping this weekend? My mum suffers from terrible psoriasis so when I was given the opportunity to test some products from Grahams Skincare I jumped at the chance and happily passed them over to mum for her opinion. 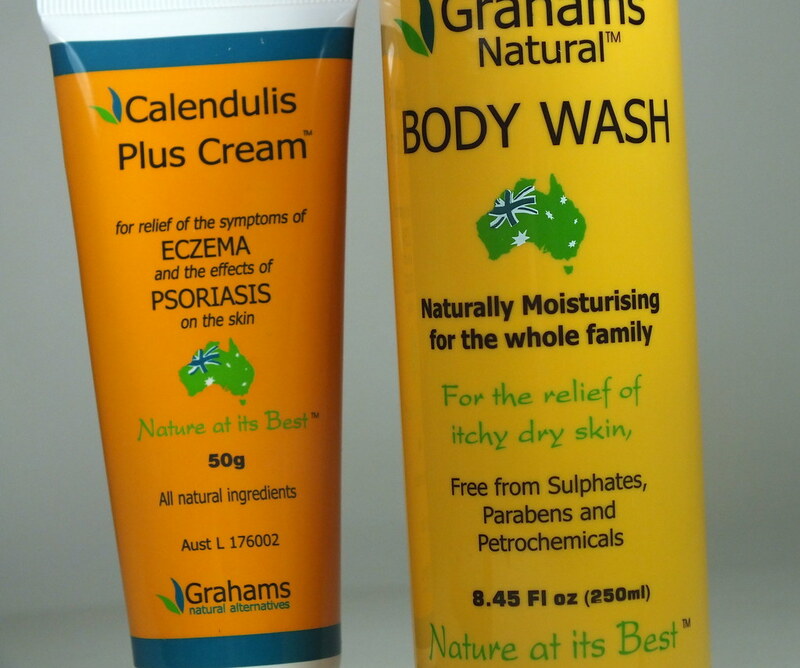 Grahams Skincare has been a hit in Australia as one of their best selling natural skincare ranges created by a father who wanted his son to not suffer with his severe eczema. The range has expanded to cover treatements for these severe cases to those who just require something to help with a psoriasis flare-up and in all case contain natural ingredients - no parabens here - to nourish and help repair the skins protective barrier. 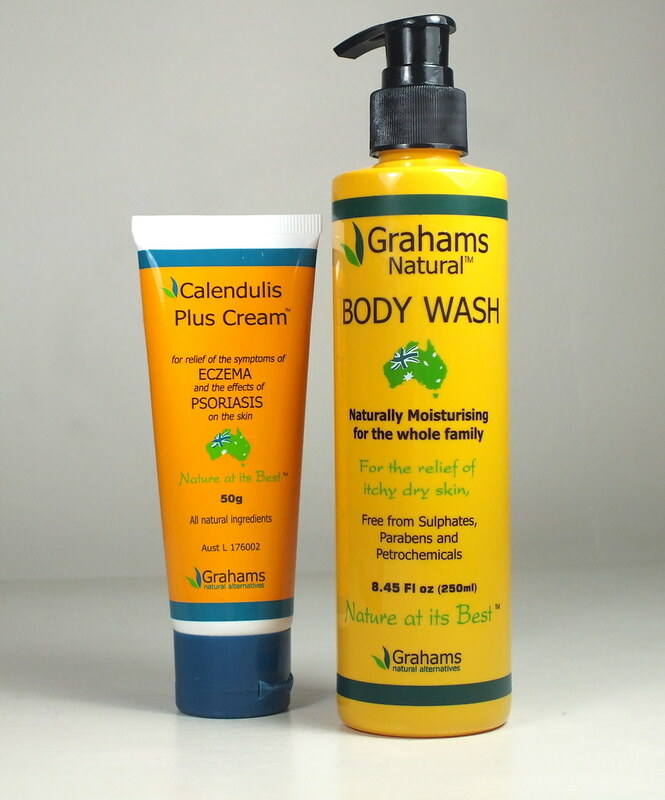 Mum has been using Grahams Natural Body Wash* and Grahams Calendulis Plus Cream* for a number of weeks now as recommended with fantastic results. Surprsingly with these types of products she found the Natural Body Wash smelt nice which made a change from often finding the products that aid psoriasis can be a little medicinal or scentless. She went on to tell me about the Calendulis Plus Cream "it's very smooth and sunk into the skin effortlessly with only a small amount needed". She is also undergoing treatment through the doctors for her psoriasis but she's found that these treatements along with the Natural Body Wash and Calendulis Plus Cream help with flare-ups and her skin is "certainly smoother to the touch". As further approval of the products last week when visiting my mum asked if I had any more of the Grahams Skincare products as she is reluctant to stop using them and didn't want to be left without reserves. You'll find Grahams Skincare online here and local pharamacies and think this would make a very thoughtful gift for someone who is a sufferer of a skin complaint as they like my mum would have had to tell people not to buy the usual luxurious shower gels and bubble baths as they cannot use them and this would be a welcome treat. As always let me know if you've any experience with these products or have other recommendations for those with skin complaints, my mum would love to hear from you. During yesterday's #fblchat it became apparent that a lot of us struggle with men's gifts at Christmas time. Thankfully the men in my life have been covered this year but here are a couple of men's grooming products that my brother (previously seen in this post) has recently been testing out for me that might be welcomed by your fellas. I must apologise in the first instance that his ravings were short and simple due to a brief text message as he was dashing off to catch a flight to EuroDisney - I am not jealous in the slightest honestly. I've documented on my blog a love of Heaven Skincare having been introduced to the brand earlier this year and I'm in good company as Kate Middleton is a fan but I only recently realised that there is a mens range, appropriately called 'His Heaven'. I received the Pre Shave Exfoliator* and After Shave Relief Spray* to pass over and my brothers comments were "pre shave cream is good and the shaving spray is brilliant". Maybe not the most eloquent of reviews but as we know some men just simply say it like it is. He also said that since using he hasn't had a shaving rash which for him is his biggest issue. Both products can be used prior to a wet or dry shave and are recommended for senstitive skin and I think they'd be fun presents for the beauty bloggers other half. 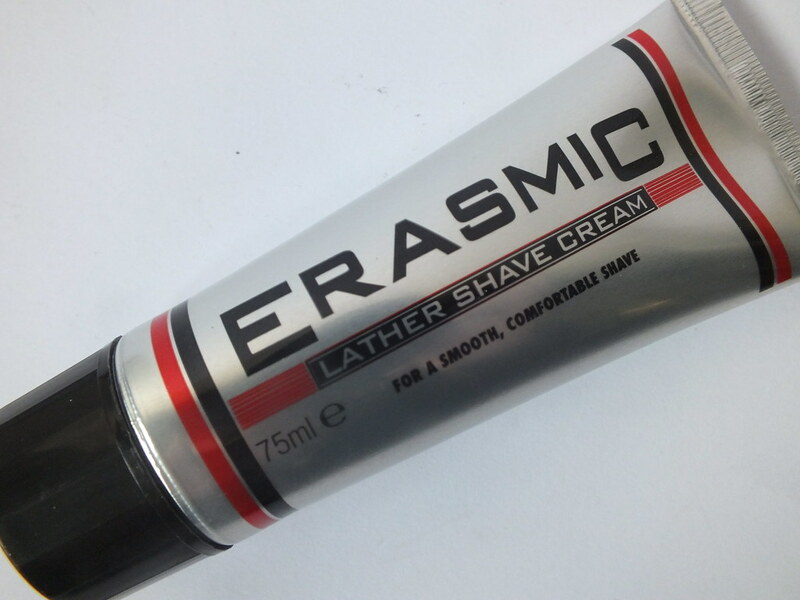 On that note it would be fun to put together a beauty hamper for the man in your life as I know that whilst men would never admit it they love to use hand creams and lip balms as well as shave creams such as the one from Erasmic available here which is at the more afforable end than His Heaven. What have you brought the man in your life and would you consider grooming products? Christmas can be a stressful time whether it's attending numerous parties or writing a million Christmas cards and wrapping presents so I thought I'd put together a few night time treats that I use to help aid my slumber as I'm not a great sleeper at the best of times. This was a gift for my birthday and swiftly became part of my evening bath time routine so much so it'll be popping up in Decembers empties post. I love adding anything to my bath that fills the whole room with it's scent and this certainly does the trick containing one of my favourite scents of eucalyptus. I'm not certain I take time to breathe deeply to release the days tension and enjoy an aroma of peach and serenity as I'm usually watching YouTube videos whilst in the bath but I do take the time to relax. L'Occitane's Lavande range has had a bit of a revamp since I received my bottle of Shower Cream. This and the hand cream which I'll get to in a moment are my least favourite products. I've discovered in using this that I'm fussy about the strength of the lavender strength and this was just a bit too floral for my liking. I also didn't especially enjoy using the cream or find it anything special but it was quite an old bottle so perhaps I can blame it on that? I picked up Ragdale Hall's Pillow Mist on a complete whim when I believe I was throwing a strop walking through Marks & Spencer Beauty Hall (reason for the strop unknown!). I liked the idea of spritzing this on my pillow before bed and I wasn't let down. The lavender scent from this I love and there's nothing better than snuggling into bed and hugging a cushion. If I had to give you one top tip for a last minute Christmas gift for any female friends or family this would be it - for £5 you can't go wrong. This isn't the first time I've mentioned Kiehls Midnight Recovery Concentrate as it's one of my favourite skincare items I've discovered on my travels. I was nervous on purchasing as it's not the cheapest of products but my bottle is lasting FOREVER so cost per use is minimal and it's worth every penny in my opinion. I hate using anything on my skin that makes me feel greasy and this oil does nothing my leave my skin soft, supply and hydrated - perfect for tired looking skin. And it smells fantastic! I'm usually a number one fan of L'Occitane hand creams but this is my least favourite. As with the shower cream I'm not too fond of the scent and this is the 'wettest' of their hand cream formulas I've used. To be honest as I'm typing this I think 2014 is the time to move on to something else and say goodbye to this product. So there you have a few of my festive sleep aids, let me know what helps you get to sleep at this busy time of year. Mac Nail Lacquers don't appear to receive much mention in blogger circles and admittedly I only have one or two in my collection but it was Dark Angel I reached for last week. Whilst this is not the most festive shade I do love a dark nail at this time of year. Dark Angel is one of Mac's Cream high gloss formula's which sadly did not meet their no streak finish and possibly there is little mention of them on beauty blogs. As you can see above the first coat was streaky and the second still showed some streaking that a third coat was required. I often paint my nails late of an evening and want minimal fuss and a trouble free application and whilst I love the colour I would be apprehensive about reaching for this without the time to give it the attention it needs to wear. The colour I love and it was one of the few polishes I found lasted well on my nails without chipping so it's not one for the reject pile just one to prepare some time to wear again. Have you had any experience with Mac Nail Lacquers? I've been pretty good lately avoiding buying any beauty products this past month so that I will be able to fully enjoy the receiving of gifts on Christmas Day and of course because money has been spent on presents for others. 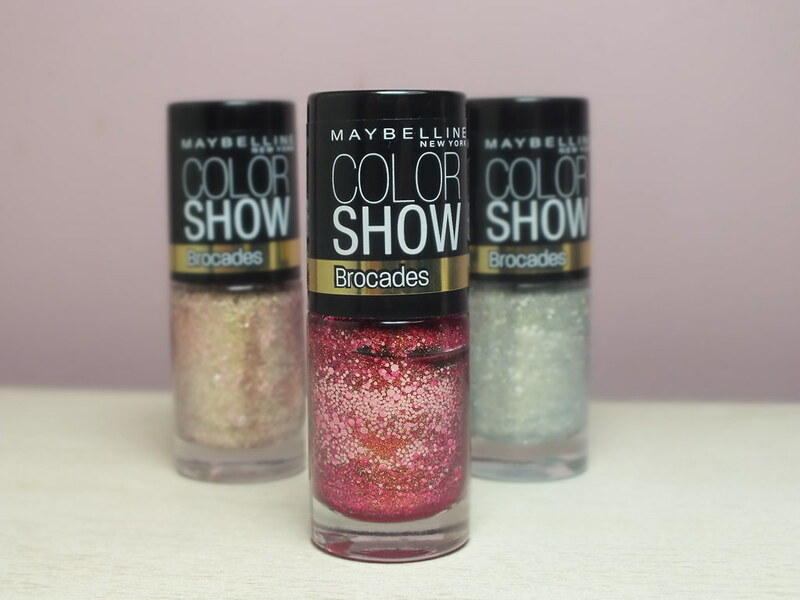 That said when I saw the Brocade range from Maybelline on a 3 for 2 offer in Superdrug last week I decided to treat myself. The shade I was most excited about was Rosy Rosettes as I had a vision for it painted over Essie Blanc. Unfortunately I didn't realise it wasn't a clear polish and was actually a full on colour as you can see below. Luckily I favour a red nail so I went to town and painted all over my nails and loved it's pinkish red tone. It didn't feel too intrusive as glitters sometimes can be and I wonder if it is a stretch to call this a sophisticated glitter? The only downside I found with this product was that it chipped really badly. Usually glitter on your nails are there for life (or so it seems) and of course when I came to remove the remainder of the colour I found I had to scrap some of it off as it wouldn't budge but that aside this is a great addition to the festive wardrobe. I've yet to try the gold and silver shades although they're next on the list for this week but I'm not looking forward to removing it. And since looking online I'm lusting for the blue version. What are your festive shades featuring on your nails this week? 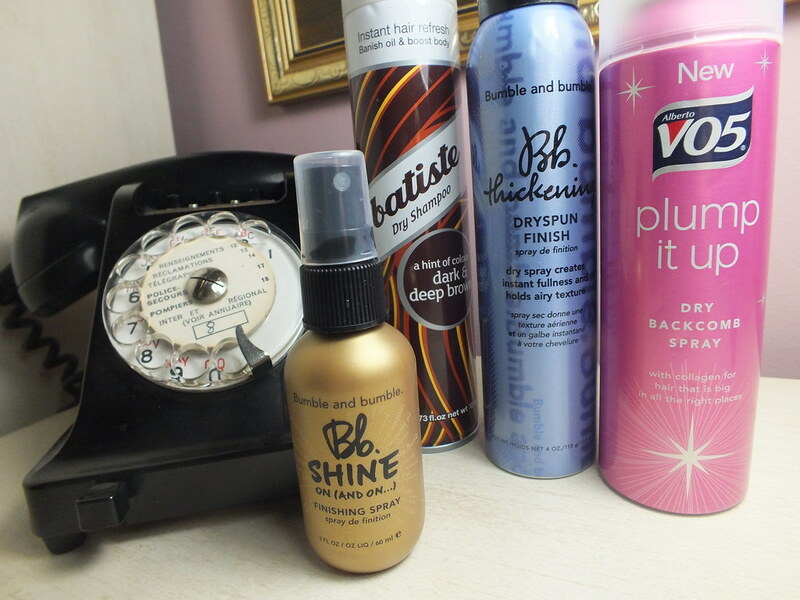 There is always a can of Batiste Dry Shampoo sitting in my desk draw at work to freshen up my hair before a night out but as I showed earlier today I'm officially spending more time dashing out from work than sitting at home working my way through my sky planner a few more items have been added to my desk to disco hair arsenal. There was a lot of hype around Bumble & Bumble's Thickening Dryspun Finish spray as a dupe for the mighty Oribe Texturising Spray and I happily jumped on the bandwagon of the 'cheaper' alternative. I can't deny I'm the sort of person who expects to simply spray a product in my hair, use a particular volumising shampoo and/or wave the hairdryer around for 5 mins and expect to walk out looking like Kate Middleton - the beauty of Bumble & Bumbles creation is that I can pretty much do that! 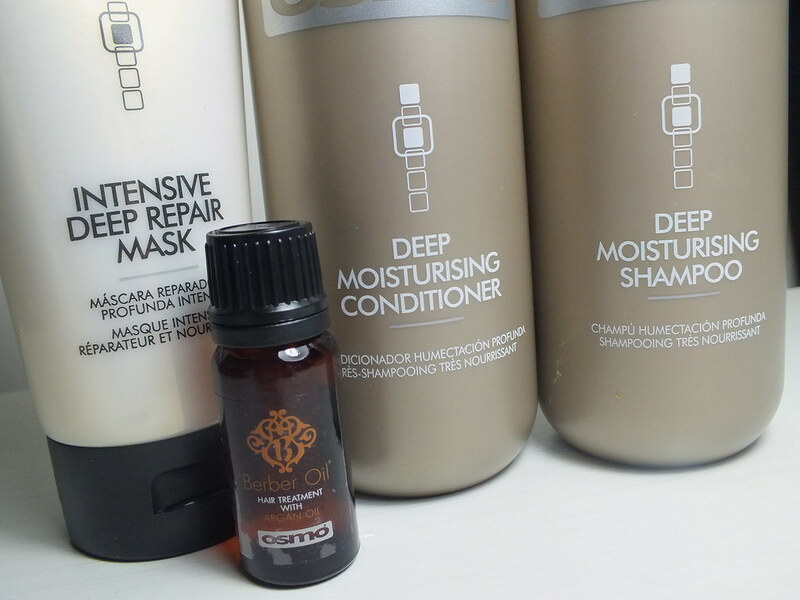 I simply spritz some into my roots, massage it about a bit and my hair is instantly lifted and the signs of a hard day at the office disappear. The biggest thumbs up from this brunette gal is that due to it's translucent nature there is no fear of any white residue giving the game away. 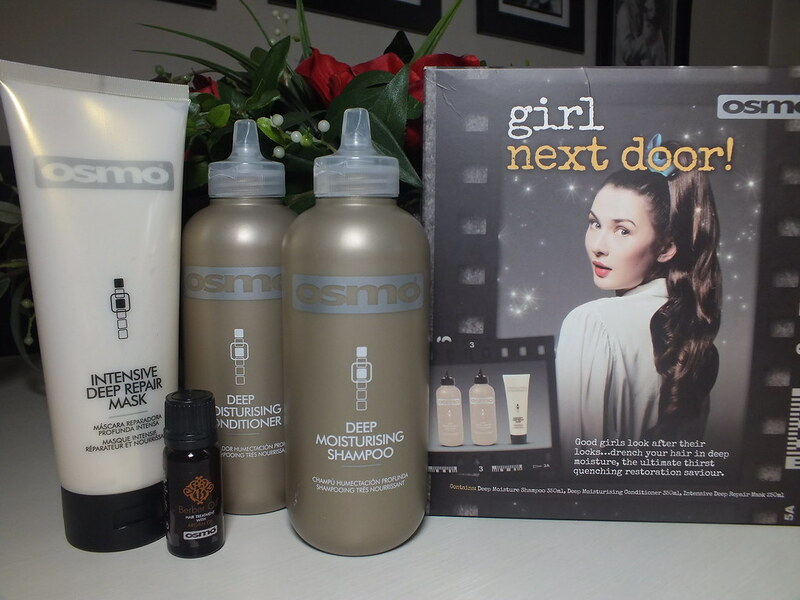 VO5 Pump It Up Dry Backcomb Spray* works great especially if I've gone for the lazy day pony tail and need to add a bit of life to the 'tail' itself or want to avoid the flat front. I opt for this on the days when I might have taken the effort to add some curls and need to revitalise before I step out for the night. Bumble & Bumble Shine On Finishing Spray created a stir during a shopping trip my mum and I had a few months back. We both decided to purchase the smaller size then popped it back on the shelf as we couldn't justify it's expense. Unfortunately hours later we were impressed with the shine or 'all day gleam' as they describe it that we returned and made the purchase. It might not be the most necessary of products but seeing your hair sparkle under the disco lights could be deemed as priceless. So there are a few of my must haves to help my hair go from desk to disco - what are your hair tips for the festive season? 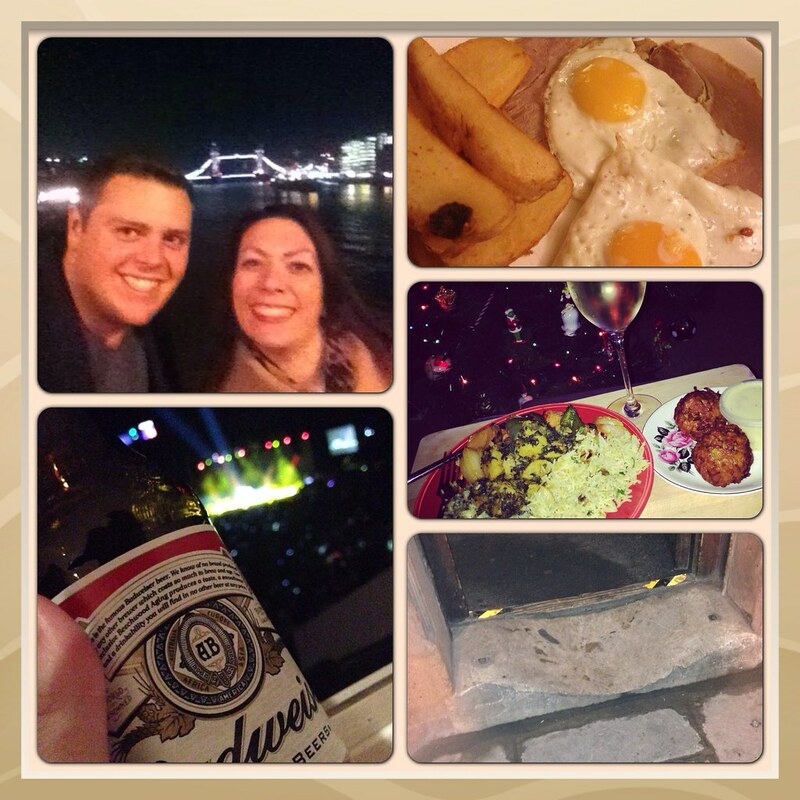 This week it felt like the silly season had really arrived with a week of late nights out, food and friends. On Tuesday there was a birthday celebration in a local pub where I was served up a delicious dish of ham, egg and chips - simplicity at it's best. On Wednesday despite the previous late night Ben and I headed back to the O2 for a Wet Wet Wet concert - and don't feel bad about my poor view I was sitting in a company box so it was in complete comfort with Budweisers placed directly in my hand - no queueing at the bar for me. Thursday despite struggling to keep my eyes open most of the day I couldn't turn down curry and wine with a friend despite plans on Friday for leaving and birthday drinks in the City with work colleagues. In the picture above you can see the step into the pub which is one of the oldest in London and that step shows the wear of people walking over it for hundreds of years. Saturday I was feeling especially jaded but Ben decided to come over, order us (another!) curry to help the hangover. The wine was kill or cure, it killed and was sipped before being abandoned for a non alcoholic beverage. I'd love to tell you my Sunday was far more productive but it was I'm ashamed to say spent in bed watching numerous Vlogmas episodes on YouTube. I have managed to return my flat into a slightly more habitual state, disposed of far too many takeaway containers (there was a chicken kebab for dinner last night!) and I hope by the time I've hit publish on this post I've managed to write out all my Christmas cards. How are your Christmas festivities going so far? I have loved reading everyone's Christmas Gift Guides although I'm slightly shocked at what some people refer to as a stocking filler. My stocking used to be filled with small gifts and sweets so I decided to have some fun and do an indulgent stocking filler guide that is only likely to appeal to those with the Khardashian sized Christmas budget. When I worked out the individual cost (£4.50) of each of the thirty baked eye shadows in Laura Mercier's Les Petitis Bonbons palette I actually found myself thinking this was quite a bargain but at £135 for the palette itself I don't think Santa will be dropping this down my chimney Christmas Eve. 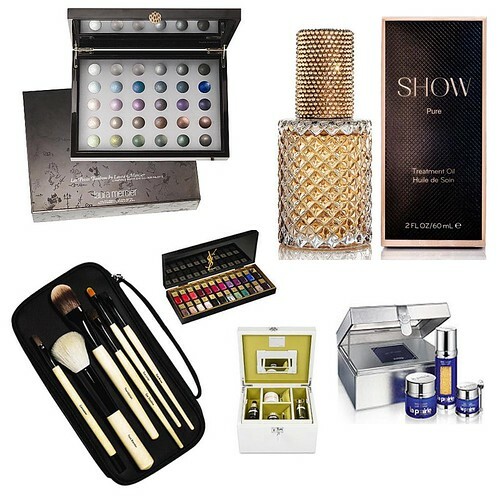 Skilled artisans hand applied over 800 Swarovski crystals to the lid of Show Beauty's Limited Edition Pure Treatment Oil which at six hours per piece goes some way to explaining the £155 price tag, as does its being referred to as 'liquid gold' by those in the know. This may be a multi use treatment oil but I'd want it to wash and blow dry my hair for the price. Despite a £395 price tag this stunning entire collection of La Laque Couture YSL nail polishes has sold out on the Selfridges website. 24 shades all stashed neatly in a beautiful black acrylic box - no Muji here - it works out approx £16 per polish. Again reasonable price individually but that is some expense at Christmas. If you're looking for a cheaper alternative Barry M have put together their own collection across their ranges at a still pricely sum but more 'budget friendly ' at £89.99 which you can find here. 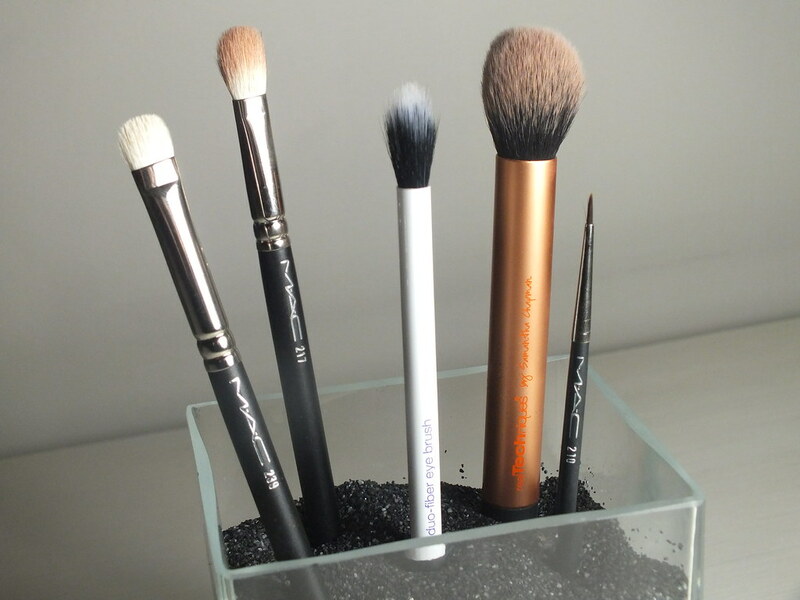 I daren't add up the cost of my make up brushes in my handbag today let alone those sitting on my dressing table but it always seems less scary when purchased individually. Bobbi Brown has put together their basic collection for a snip at £144. Creme De La Mer is pricey. Asprey is pricey. 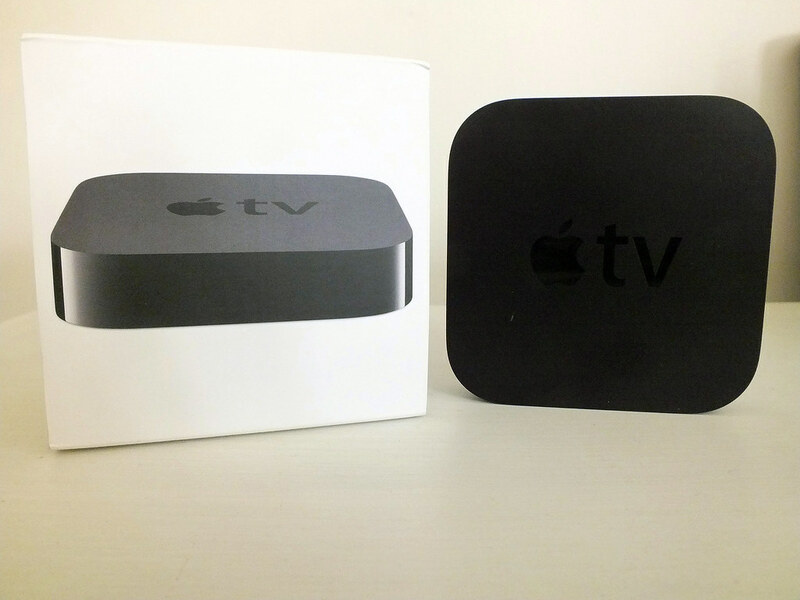 Put the two together and you have a Christmas gift that costs more than 3 months rent. Only 111 cases created with a plaque etched with it's number you'll have to be quick to grab yours. Containing moisturising creams, eye concentrate, serums and much more for £2750 I think I'd rather have a Chanel bag if that's the price limit for my gifts. Compared to Creme De La Mer this La Prairie gift set is cheap at a quarter of the price. £632 transforms your skins appearance with their range of caviar products. I don't know about transforming my skins appearance, I'd want to look at least 5 years younger if I were to spend £632 on skincare. I hope you enjoyed my fun Christmas gift guide and leave me a comment about some of the gifts you've seen for sale lately with extortionate price tags. 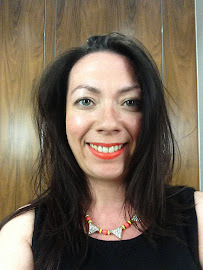 If you've read any of my posts featuring skincare you'll know I bow at the alter of Caroline Hirons and am one of the lucky few to have had a consultation with her which you can read about in this post. Luckily everyone can ready her blog here and find out so much about skincare products and regimes. I'm lucky considering years with lack of a skincare regime and a smoking habit that my skin has faired quite well. I experience the old oily t-zone in warmer times or when unwell particularly but otherwise I can pretty much throw anything at my skin and it'll hold up well. Lighter products and a simple routine suit me best otherwise I find the oil ups it's appearance. I actually don't use any specific products to tackle blemishes. I only experience the odd spot for hormonal reasons or if I've been slack with the skincare regime so haven't found the need but do recommend anything you think I should have on hand. I've always stayed away from skincare wipes and whilst I don't think they'll ever replace the routine I have in place now I do love Heaven Skincare wipes which you can read my review of here and they are perfect for late nights and lazy days. Yay for toner and I'm in the group that uses both an exfoliating and hydrating toner. High-end skincare or high-end makeup? High-end skincare when budget permits. The drugstores are really excelling in the make up stakes these days but for now I think high-end is the right place for skincare if your purse allows it. That said I've been enjoying testing Vichy products and recently discovered Palmers have a skincare range which I've been dipping in to. I don't think I've used any particularly unusual products although the most unusual treatment was the oxygen facial at one of House of Rush's beauty blogger events..
Don't smoke, drink lots of water and always remove your make up - I can't promise they're rules I always live by but they're the obvious ones. Don't forget to leave me your skincare tips and any product recommendations. 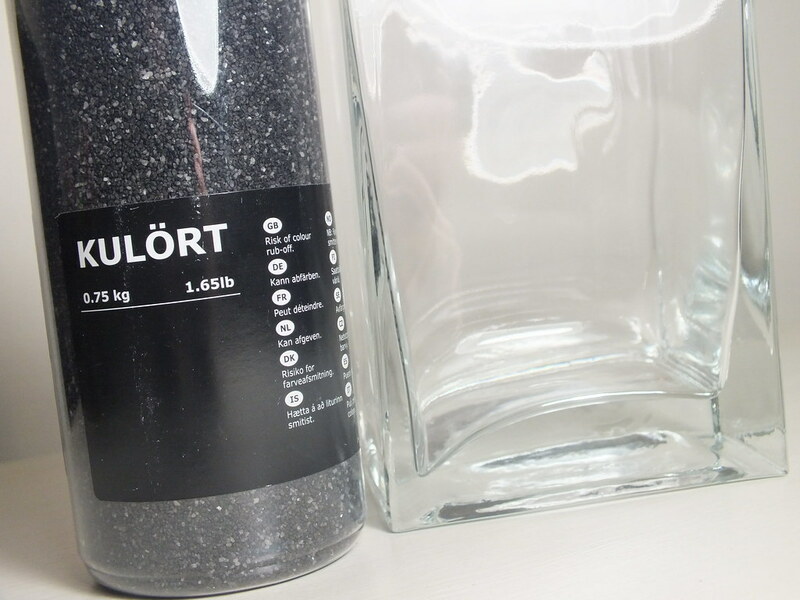 A few weeks ago I took a trip to IKEA and I decided to throw a vase and some crushed glass into my basket with a view to using as make up storage and it worked surprisingly well. The crushed glass is rather thick so depending on brush size will decide how many brushes you can store but it works so much easier for now than an emptier glass and far easier to find the brush I'm looking for. 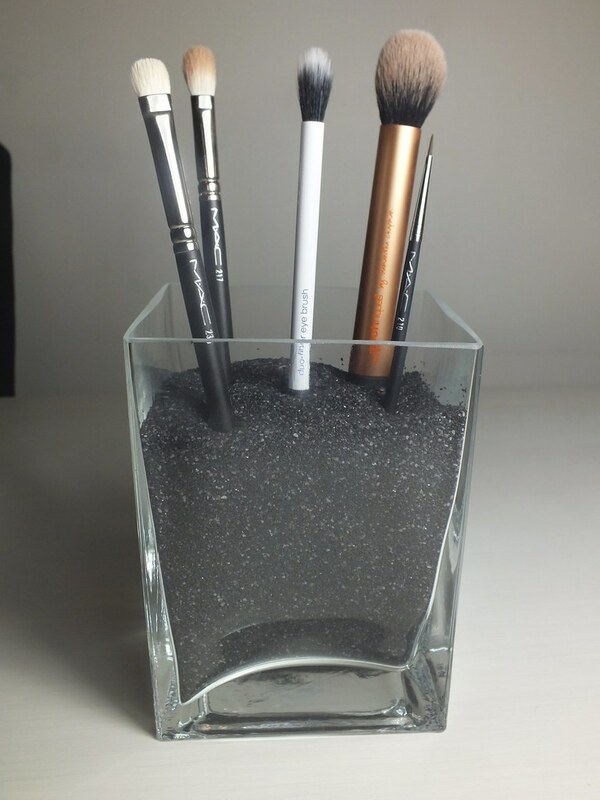 I'm still not convinced this is the final storage method for my brushes and would prefer a different colour of the crushed glass and maybe a different style of vase but it's a great starting point and proving useful for now. 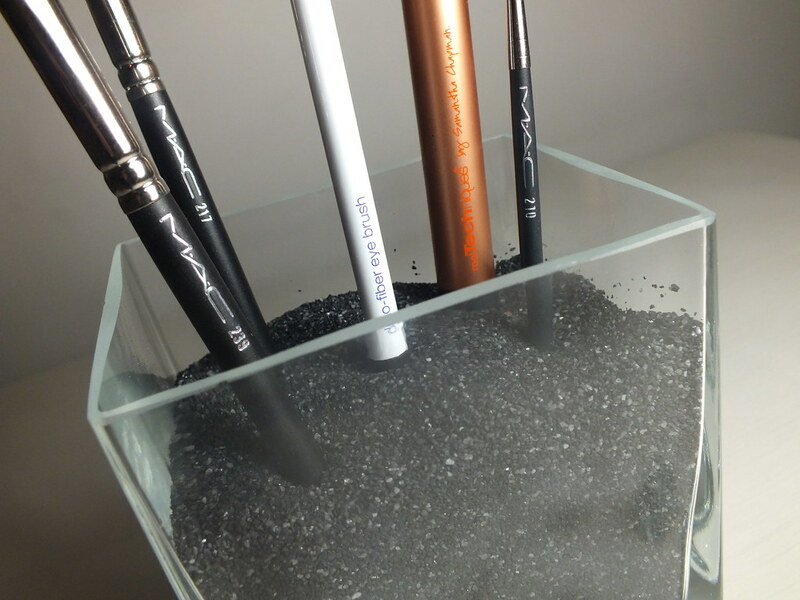 How do you store your make up brushes? This tip is a little late for this year but definitely something you can think of and plan ahead for next - I know I know we haven't even got this Christmas out of the way! 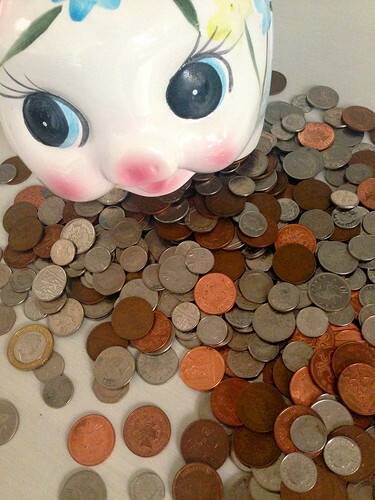 I have a cute vintage piggy bank which sits in my hall keeping watching over my front door and every evening I go through my purse and any 1, 2 and 5ps are thrown into the pot. I also take any 10 or 20ps that don't add up to 50p and throw them in too and then just leave it to gather throughout the year. At the beginning of December I took a heavy bag of change to my local change machine and cashed it all in. I was impressed to find I had nearly £70 in change which I promptly used towards presents and cards. I was good last year and actually brought a lot of cards in the sale but those for parents and best friends I like to buy at the time and this extra cash makes things a little easier on my bank balance. Having seen this cash mount up and spent wisely I'm definitely encouraged to keep it up in 2014. Does this sound a good idea to you? 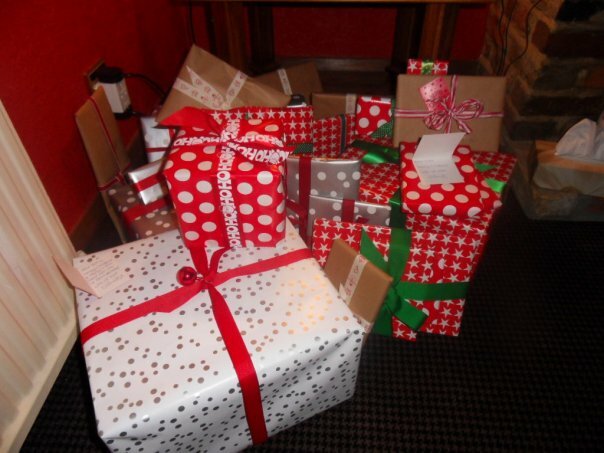 Don't forget to comment and let me know your thrifty tips for making Christmas expenses easier. 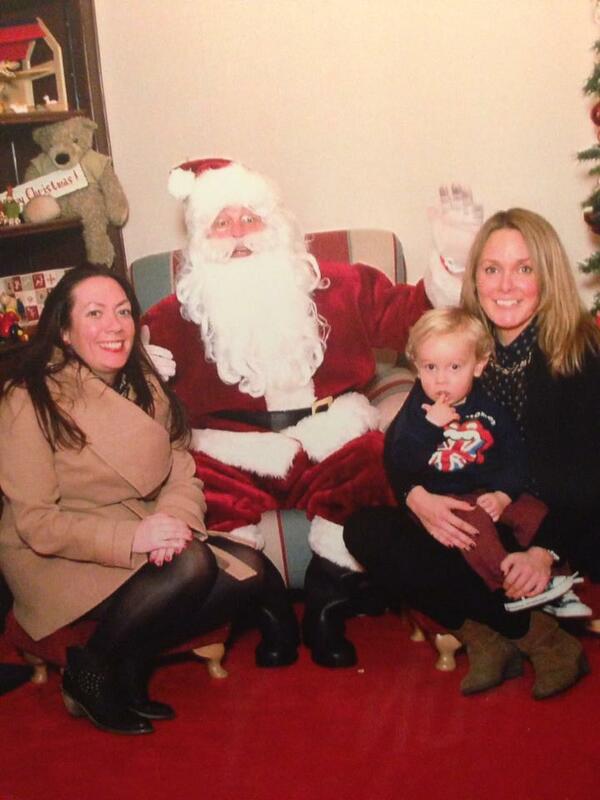 Last Friday I took another day off of work for some festive fun with my friend and her little prince Charlie. 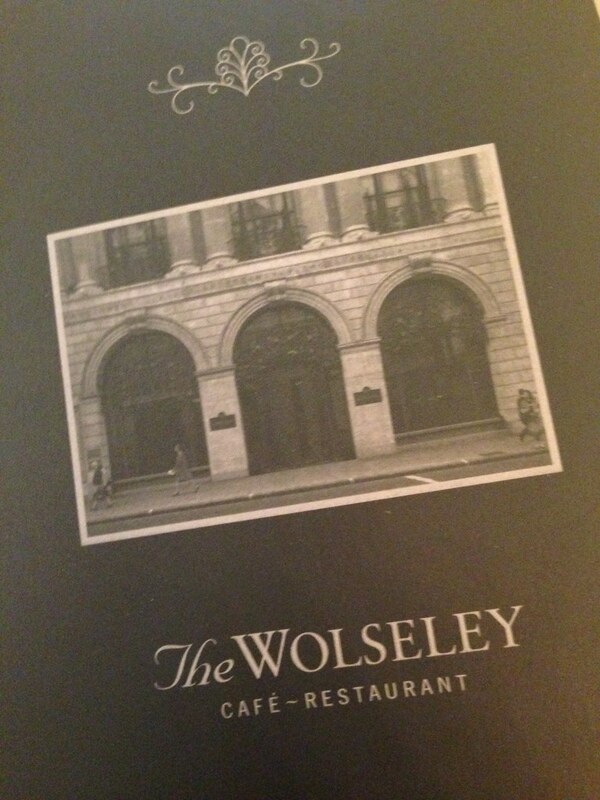 First order of the day was breakfast at The Wolseley. 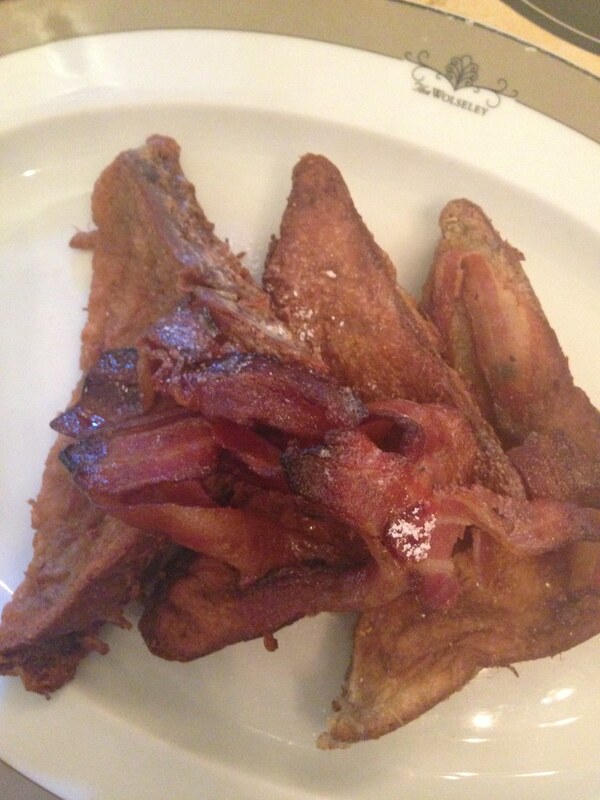 I've walked past The Wolseley so many times but never ventured inside so I was really excited and dived straight into my french toast with bacon - it was as delicious as it looks. The Wolseley is like walking onto a Downton Abbey set and is lively and buzzing with atmosphere and I'd highly recommend a visit (don't forget to book in advance). The staff were fantastic and I was particularly impressed that they brought Charlie's food up immediately after ordering to ensure that he didn't have to wait too long and get restless. 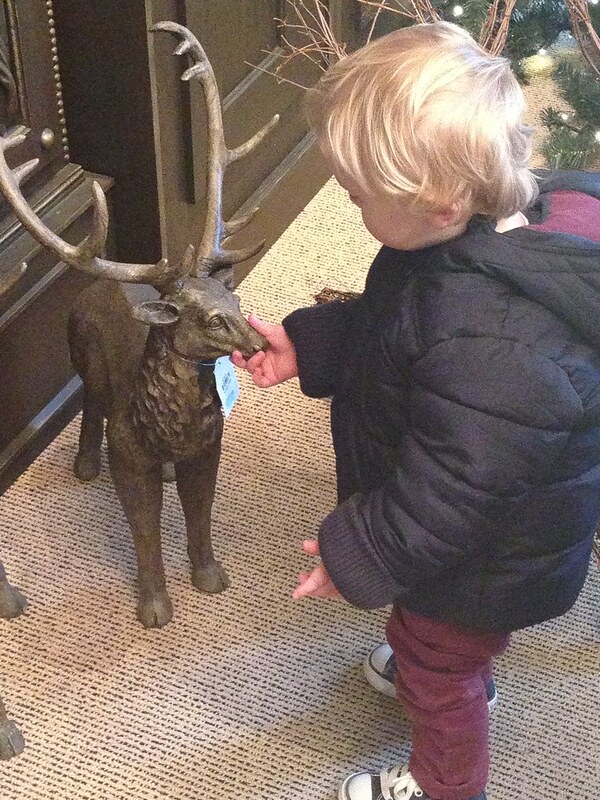 We decided to walk off our breakfast in Fortnum and Mason Christmas department where Charlie made friends with the reindeer. My mum and I are planning our annual Christmas trip the weekend before Christmas so I'll try and get some photos for everyone and do a more in-depth post then. 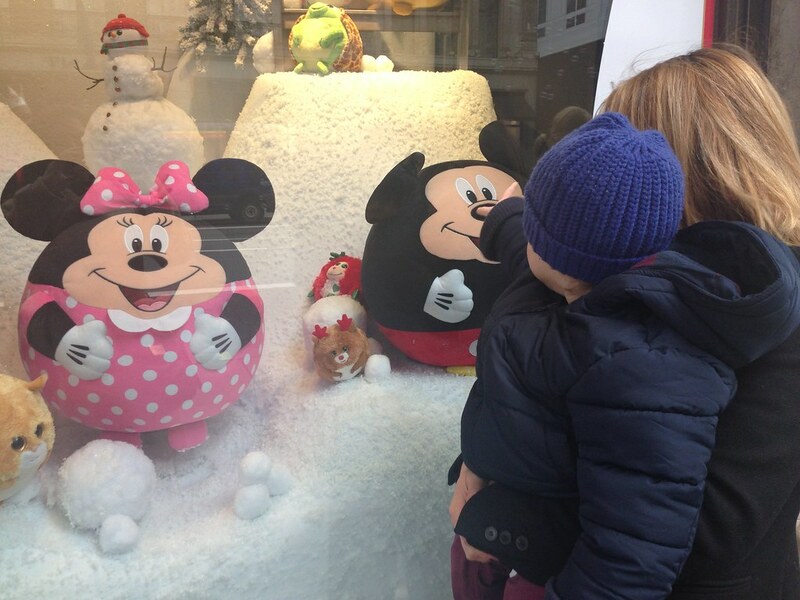 Next item on our agenda was Hamley's where Charlie admired the Christmas windows. I don't know if anyone else has been to Hamley's lately but I found it rather disappointing. Compared to Toys R Us and the like its quite small and extremely expensive. We saw toys we'd brought previously for in excess of £20 so we decided to save our pennies for elsewhere. 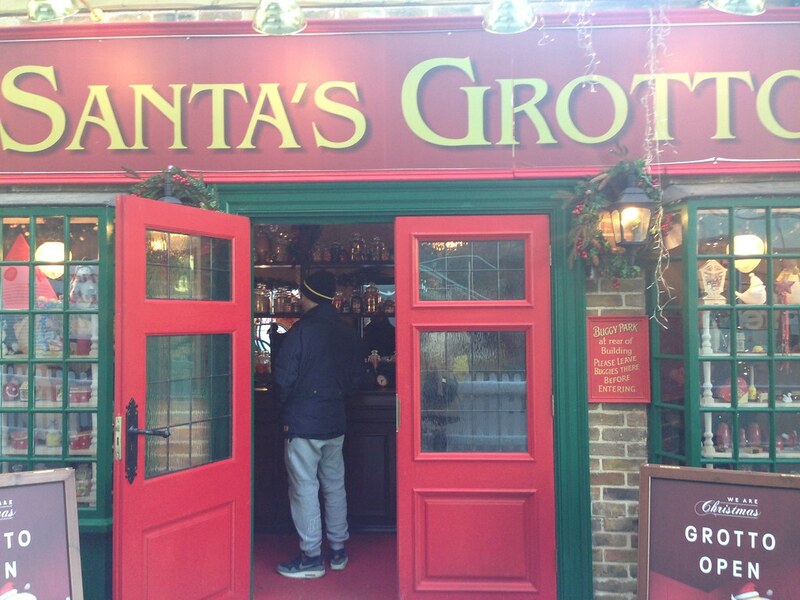 Last stop was Santa's Grotto - a good place to stop if you ask me. We decided to book the Grotto at Westfield Stratford after comparing prices at other venues and it made sense for us to park there in the morning. Despite not having children myself I've spent a number of years accompanying friends children on their visits to see Santa and this is by far the best I've ever seen. On arriving you are taken into playroom where photos are taken of the children and they can run around climbing on a sleigh and putting together a soft Christmas tree. Then you are led into a small theatre where a Christmas story is shown, featuring the faces of all the children present (hence the earlier photos). Once the short movie has finished 3 families are taken in to meet Santa. You are all invited to sit round at Santa's feet whilst he has a chat to all the children about how busy he is etc and then it's photo time. I was thoroughly impressed and at a cost of £4pp it was one of the cheapest on offer. It was time for Charlie to head home after a long exhausting day so I decided to do some more shopping at Westfield and then relax in the cinema to watch The Hunger Games, Catching Fire. I'm not an uber fan of the films, I didn't mind the first but wasn't particularly impressed and thought the second was worse, quite slow and boring - it was nice to sit and take the weight off my feet for a couple of hours though. I'll leave you with the photo of me and Santa and don't forget to comment and tell me about the festive fun you've been having.